Uncovering and communicating the truths about human conflict, human suffering, and human rights violations is a complicated but vitally important task that often falls to those who write the “first rough draft of history”—that is, journalists operating on the front lines of conflict zones or under cover. 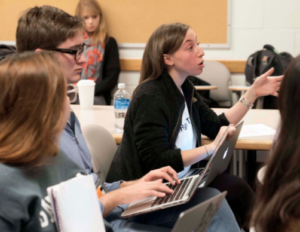 Training communicators to make sense of atrocity and humanitarian disaster was the motivation behind Media & Atrocities, an interdisciplinary course offered for the first time this semester at Syracuse University. The course was co-taught by David Crane, Professor of Practice at the Syracuse University College of Law and member of the faculty of the Institute for National Security and Counterterrorism, and Ken Harper, Associate Professor of Multimedia Photography and Design at the Newhouse School and director of the Newhouse Center for Global Engagement. The course examines the critical roles that law, policy, and communications play in ensuring truth-telling and securing justice for victims of atrocity, often by providing international law organizations with the raw information they require to bring humanitarian law violators to justice. Harper says he and Crane believe it’s the first university course of its kind. “These students will become young professionals who are trained to seek and present information on atrocities, genocide, disaster … basically, making the unthinkable understandable,” says Harper. 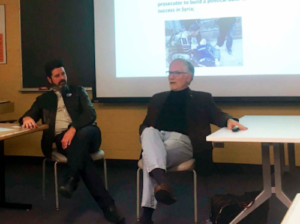 Special guests—including Ploughshares Fund president Joseph Cirincione, CNN senior UN correspondent Richard Roth, and Physicians for Human Rights researcher Christine Mehta ’11—participated in class discussions via Skype. 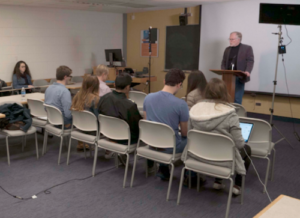 Students in the course included both undergraduate and graduate students from a variety of programs across campus, such as international relations, broadcast and digital journalism, public affairs, photography, and law. They began the semester by examining the meaning and history of atrocity, reviewing legal developments over the past century, and learning about the modern international criminal law system. Most of the semester was spent building a mock postconflict justice tribunal for Syria. Students chose various roles—such as prosecutor, journalist, public relations officer, or activist—and carried out a series of practical exercises in preparation for the final exercise, held on the last day of class: a press conference called by the mock tribunal’s chief prosecutor (played by Crane) announcing an indictment against Syrian President Bhashr Hafez Al-Assad. Students also set up a public relations office; organized a PR plan; staged a news broadcast; and developed a coordination plan for NGOs working in Syria, as well as a model for the organizations to work together into the future. Zach Krahmer, who is earning a master’s degree in photography from the Newhouse School and an executive master’s degree in international relations from the Maxwell School, says he chose to enroll in the class because he is interested in conflict resolution and has worked with communities that have experienced trauma. “I wanted to think critically about the way we produce and consume media that involves atrocities, and the responsibility that implies,” he says. He notes a particular assignment that had him and his classmates explore the ways social media have been used in various campaigns, with the resulting presentations touching on everything from the Colombian plebiscite to Buddhist extremist groups in Myanmar to Assad. “I was surprised by the innumerable ways that perceptions of events had been manipulated by tactful use of media,” he says. Crane knows intimately how important good journalism and good public relations are to the success of postconflict justice. As the founding chief prosecutor of the Special Court for Sierra Leone—an international war crimes tribunal set up after a devastating civil war—Crane held frequent press conferences and town hall meetings with ordinary citizens seeking justice for war crimes and crimes against humanity, helping them to engage with a lengthy and esoteric process and to accept its findings. 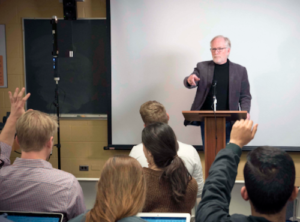 Today, Crane and his law students in the College of Law’s Syrian Accountability Project (SAP) rely on ground reports from reporters, photojournalists, and others in the field. SAP is an internationally recognized, cooperative effort to document war crimes and crimes against humanity in the Syrian Civil War. The students log reports of crimes in their “Crime Matrix,” which is filed with international clients such as the United Nations and International Criminal Court. The intent is that the Crime Matrix will help form the basis of a prosecution of those most responsible for humanitarian crimes after the conflict ends.